Tobi and Rico have redeemed the prize they won at the Big Brother Naija house during the Nokia challenge task. 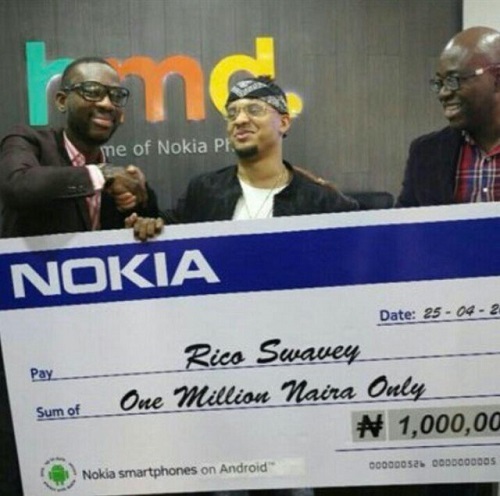 Tobi Baker and Rico Swavey, two former Big brother Naija 2018 housemates were all smiles as they received their 1million naira prize each from Nokia. The duo received the money after winning the Nokia challenge task while in the house. Tobi and Rico smiled to the camera while thanking Nokia for fulfilling its promise. Writing words of appreciation while receiving the money, Tobi said: "So...you guys remember our entry for the Nokia Challenge? We received a lovely Prize! Couldn't have done it without your support #TeamTobi."